This morning, a Twitter follower tipped me off that MoviE-Town is on the market for $2.2 million. For the local community, that's news in and of itself. And my immediate thought was, "Hopefully the new owner will pave the parking lot" because the large lot on the north side of the building is rife with potholes. But they really could be the least of our worries. It dawned on me that small theaters are facing some dire decisions about buying and installing digital projectors. I've heard about this in the news over the past six months, and the economic impact could be great. As this USA Today article explains, digital movie projectors cost between $50,000 and $70,000. With eight theaters at MoviE-Town, that's potentially $350,000 -- not a small investment. The current owners pony up the money to buy digital equipment. But I have a feeling that's why they're trying to sell the theater now. 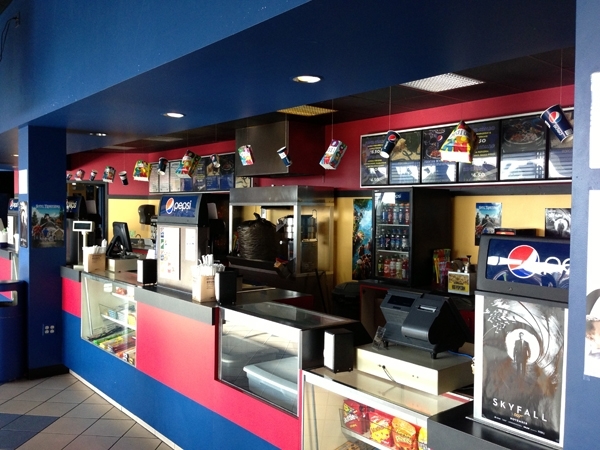 A new owner buys the theater and makes the investment in digital equipment. The theater closes because no one wants to buy digital projection and make the necessary improvements to the parking lot and upgrade the interior (because, let's be honest, MoviE-Town is showing a fair amount of wear and tear after more than a decade in business). If No. 3 happens, Elizabethtown and economic development in town will take a step backward. I think most of us would agree that the merchants downtown are on the brink of turning Market Street and High Street into a great destination. Being able to say Elizabethtown has a multiplex adds value to a great community. Its central location means we locals don't have to drive even as far as Hershey, let alone to Harrisburg or Lititz to catch a flick. Let's hope some local businesspeople see the same value and are willing to make the investment and keep MoviE-Town open. This is coming from someone who worked there for 10 years. It would be wonderful if someone where to buy and invest into the building, but there are way more issues than just the parking lot and the digital projectors. It might be cheaper to tear the place down and rebuild. I think this town needs to think about doing alot of things. I'am so tired of having to leave town to go buy anything. All we have here is pizza shops and hair salons. We need to look at mount Joy and see how much they have grown. As to downtown there is nothing there. I have lived here for 30 years and I have seen this town just keep getting worse. I'm tired of naysayers. Last Friday, my family and I spent the evening downtown at Second Friday where we visited shops set up in the former Roth's Furniture building and several others. Did you know there's a new place that on West High Street that smokes meat and sells speciality cheeses? Have you patronized the bakery on the square? What about Folklore Coffee, where on a recent Saturday morning the staff said, "Do you know how to tell it's Saturday? There's a line." So let's stop with the negativity and start supporting the things that merchants and others in the community are trying to do. I'am not trying to be negative. I also have supported the merchants each and every event that has taken place. Yes I have visited the bakery more then once and every shop in town. I also know about the new smoke meat shop that has opened and have also made a purchase in there store. I along with a group of walkers walk downtown every evening for the past 2 years. So I know whats going on. I have also looked into opening a buisness myself downtown but after talking to your merchants have decided to open my buisness somewhere else. I think Elizabethtown is a great place to live and raised my children here and would do it again. However I would still like to see some changes in Elizabethtown. It's just terribly frustrating to hear people say the town keeps getting worse when clearly it's not. I'm curious what kinds of changes you'd like to see. It's not fair to say that they are naysayers. You open this up to discussion and have to hear all sides and complaints. There ARE a ton of pizza places and tanning salons, that can't be ignored. I met with a chamber member who said that Etown doesn't want to admit there is a parking problem. I'd like to see a parking garage but that would cost a fortune. I'd like to see a farmer's market and close market street at the square once a quarter for a walking mall and have a community fair. Yes, there is an abundance of pizza shops and hair stylists. But I think the borough is doing what it can to create an environment where other kinds of businesses can thrive, and that's why you're seeing a bakery (that's moving to a larger location on the square), a coffee shop that is always busy and is celebrating its third anniversary, Rooster St. Provisions that cures its own meats (try the mustard brown sugar bacon!) and more! But naysayers? When someone in my church says that Rooster St. will never survive because of their location, they're being a naysayer. When someone says you can't find parking in downtown Elizabethtown, they're being a naysayer (the only times that I've had any serious trouble parking downtown were for the Taste of Western Lancaster County when half the town is stuffed into the library). Your ideas about a farmer's market and closing the square once a quarter are great! One of the reasons we don't close Market Street for an extended period of time is because of truck traffic. Tall semis can't fit under the train bridge on West High Street. But if we could close it for, say, one of the Second Fridays, that might work. Just a thought. What E-town really needs is a franchised restaurant such as Applebee's or Texas Roadhouse to replace one of the unnecessary pizza shops. This will give members of the community a chance to dine somewhere other than Rockwell's. Lets also be honest that Hoss's and Lucky Duck should not even be considered restaurants. 1. Let's think about where Applebee's and Texas Roadhouse are located. Almost always they are in shopping centers with big box retailers. The E-town area doesn't have those yet. I see it as highly doubtful that any of those franchises opens until then. 2. Why do we have to be negative and tear down existing businesses? The times that I've eaten at Lucky Ducks have been great. Hoss's is Hoss's and doesn't pretend to be anything else. I think it's great that Rockwell's is so successful. It's just not my thing, so I choose not to frequent it. 3. Of you are talking fine dining, or at least above average, you missed the Black Gryphon. Outstanding food prepared with fresh seasonal ingredients. And they have a beer menu that is hard to beat.